It turns out that Silph Co. is being forced to produce advanced technology for Team Rocket. You must reach the top floor and free the company President from Giovanni's clutches. If you roust Giovanni, you won't have to defeat the rest of Team Rocket's agents individually. 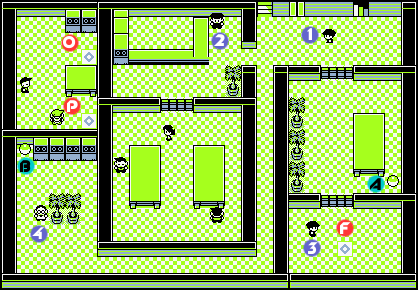 When you need to heal your Pokémon, look for a woman at the bottom-left corner of the ninth floor. This 11-level building, with 31 trainer battles, only seems difficult. If you know where to go, you can make it to the top and save the president quickly and easily. Then, after scaring Team Rocket away, you can get the items without opposition. The first floor lobby is eerily empty, so just advance to the stairs in the back. 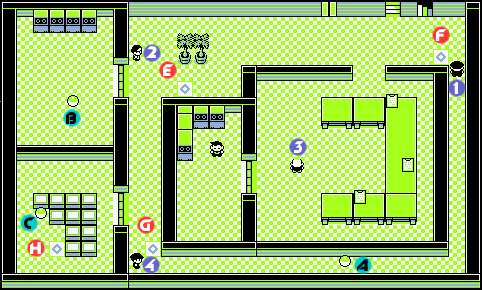 Note that the guard blocking the entrance to the building won't stand aside to let you in until you've cleared Pokémon Tower. Note that the red circles on this map indicate the warp points that connect two teleportation tiles with the same letter to one another. If you need combat experience, don't hesitate to seek out every Team Rocket agent and challenge him or her to duel. If you want a quick end to this situation, however, run straight up the stairs to the ninth floor and take the teleporter marked G to the fifth floor. Next, grab the Card Key, which will open every electronic door in the building. 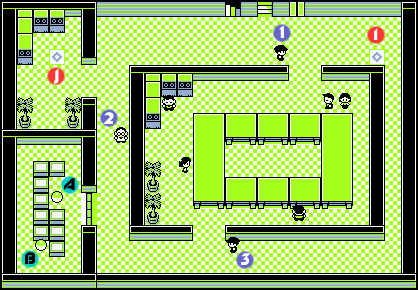 Then come to the 3rd floor and use warp tile O to reach the 7th floor (be prepared for a battle with your rival), then step on warp tile P to reach the hallway outside of the President's office. Don't be confused by all the teleporters: the elevator will take you to any floor you want, and you only need to use one series of teleporters to get to the right part of Floor 11. First go to Floor 5 and get item A, the Card Key. With that, you can open any of the locked doors. Also, one of the potted plants on this floor hides an Elixer. 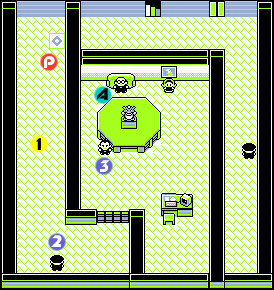 Be wary of the bald guy on this floor--he's the only one to use Psychic-types Kadabra and Mr. Mime. If there's a Pokémon on your front line with low HP, it'll be knocked out pretty quick, so be sure to put a strong Pokémon on top before entering battle. Then head down to level 3, unlock the door in front of the teleporter marked O, and then take that to the 7th floor, where your rival awaits. Your rival will be waiting for you before you approach Giovanni. 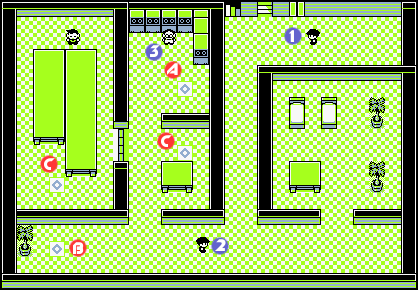 The teleporter right past your rival (P) takes you directly to the 11th floor, but you may want to heal up on the 9th floor before you face Giovanni. By the time you reach the 9th floor, your team is bound to be a bit worse for the wear. 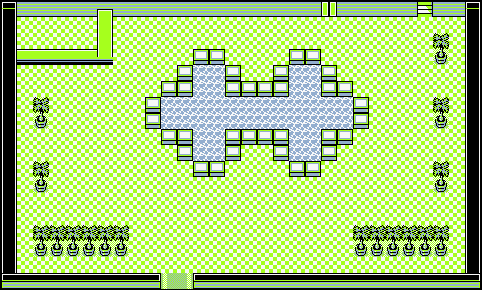 Visit the woman in the lower-left corner of the floor to fully recover your Pokémon's HP and PP. Also, check the foot of the bed to the left of the nurse to find a hidden Max Potion. 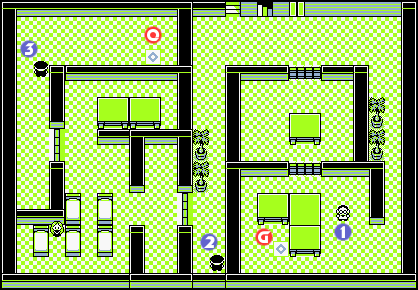 On the 11th floor, Yellow players will have a skirmish with the laughably weak Jessie and James, and Red/Blue players will have to deal with one more Rocket. Then there's Giovanni... After you busted up his racket in Celadon City, Giovanni moved his base to Saffron City. It's too bad for him you arrived in time to short-circuit his new scheme. Defeat Giovanni's Nidorino, Rhyhorn, Nidoqueen, and Kangaskhan (or Persian, in the Yellow version) to rescue the Silph Co. President. Once again, a single level 43+ Kadabra can take care of them all. He's not any tougher than your rival, but you'll definitely need to be in peak condition to stand a chance. 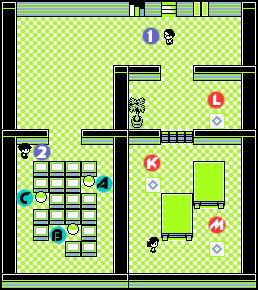 Use Dig to warp back to the Pokémon Center, or retrace your steps and take the elevator up to Floor 9, where the girl will heal you. Once you've sent Giovanni running, the President of Silph Co. will be ecstatic that you interrupted his "meeting" with Giovanni. To reward you for breaking Team Rocket's hold on his company, he'll hook you up with the incredible Master Ball. This technological wonder will catch any Pokémon without fail, so be sure to save it for a special occasion (such as Mewtwo). 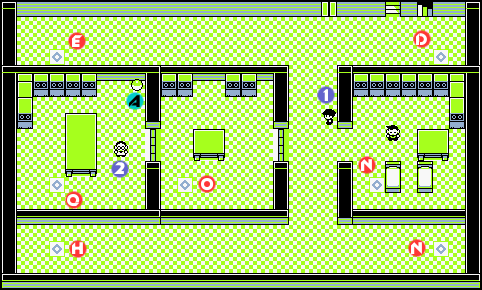 When you're finished, you can collect the items in the now Rocket-free lower floors. The next destination is Fuchsia City, where you can finally get HM 03 (Surf) and HM 04 (Strength), the last items needed on your quest. There are two major routes you can take: Routes #12 through #15, which is south of Lavender, and Routes #16 through #18, west of Celadon City. The latter path is quicker (and you can pick up HM 02, Fly, on the way! ), so it is covered first. But you'll need to take Route #12 to get the Super Rod at some point. Talk to the Silph Co. employee next to your rival after your fight for a well-deserved reward: a Water/Ice-type Lapras. This is the only place you can get one in the game. Lapras comes at a very low level of 15, making it very impractical to incorporate into your main team. In-game, you will be better served by picking up a Dewgong from Cinnabar or Cloyster from the Seafoam Islands. However, competitively, Lapras's excellent offensive power, ability to learn Thunderbolt, and absolutely incredible overall bulk put it in a class all its own above its fellow Ice/Water brethren. Even if you do not put it in your line up, carefully stash this gem in your box. This page was last edited on 6 February 2017, at 20:27. This page has been accessed 1,888,177 times.